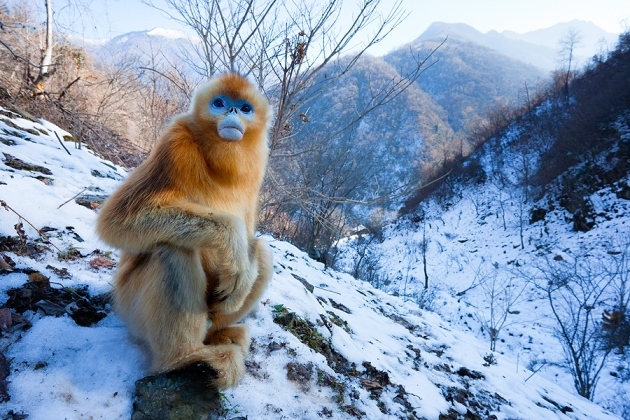 The Golden Snub-nosed Monkey (or Sichuan Snub-nosed Monkey) from China is found in a very small region in the mountainous forests. It is one of the three snub-nosed monkey species from China and is also the most widely-distributed type. Scattered in three subspecies, they are called ‘Sichuan golden hair monkey’ in their homeland, and are arboreal (living on trees). These diurnal old-world primates are primarily a herbivore, and have been protected by law since 1957. Size: The males can be anything between 58.2 and 68 cm, while the females are shorter being between 47.5 to 51.8 cm. Weight: Males are about 16.4 kg while the females are much lighter at around 9.4. Fur/hair/coat: The head and shoulder region is covered with orange tan to golden fur that lightens to pale or grayish white down to the other parts of the body. The density of color changes with seasons. Head and Face Features: Somewhat rounded head with two small ears, and the face color being pale blue-white. The mouth can open wide and has a sharp dentition (teeth). Hands: Arms are strong with a finger count of 5, ending in nails. Hands are entirely covered with a relatively less dense coat. Eyes: Round to almond-shaped with black pupils. Nose: Blunt, with nostrils facing the front. Tail: Long; measures between 56 and 72 cm, completely covered with hair. 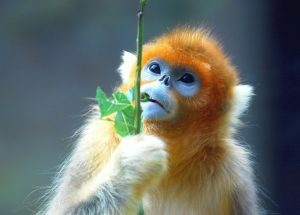 The longevity of the Golden Snub-nosed Monkey has not been described; however, they can live for a maximum of up to 30 years as pets or in captivity. 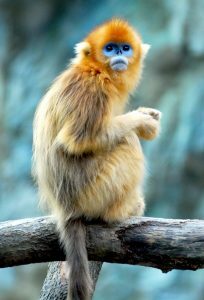 The Golden Snub-nosed Monkeys are found in the western-central regions of China including the provinces of Shaanxi, Sichuan, Hubei, and Gansu. These animals prefer living in the high altitudes of about 3000 meters in the coniferous, mountainous, and the broad-leaved deciduous forests especially during the summer months (before the infants are born). However, to avoid the cold weather, they might migrate downwards with the entire group to relatively lower altitudes in winter. 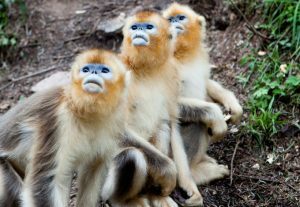 Like other primates, these monkeys are gregarious, living in groups of about 20-30 during winter, and as large as 200 during the summertime. Interestingly, a few of these groups might further combine to form vast bands of even 500-600 individuals. Furthermore, the entire group gets itself sub-divided into smaller units with about four females with their babies, dominated by a healthy male. The members of a lower unit find food from tree to tree, though at times, on the ground as well. 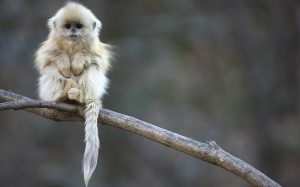 Being primarily arboreal, when they feel threatened, they tend to climb up into the trees in no time. The females that have already given birth outrank the ones that are barren. On the contrary, the males that have several mates, or those with courage and perseverance, gain a higher rank in the society. The primary diet of the Golden Snub-nosed Monkeys mostly includes young firs, pine needles, tender bamboo leaves, flower buds, shoots, and fruits. 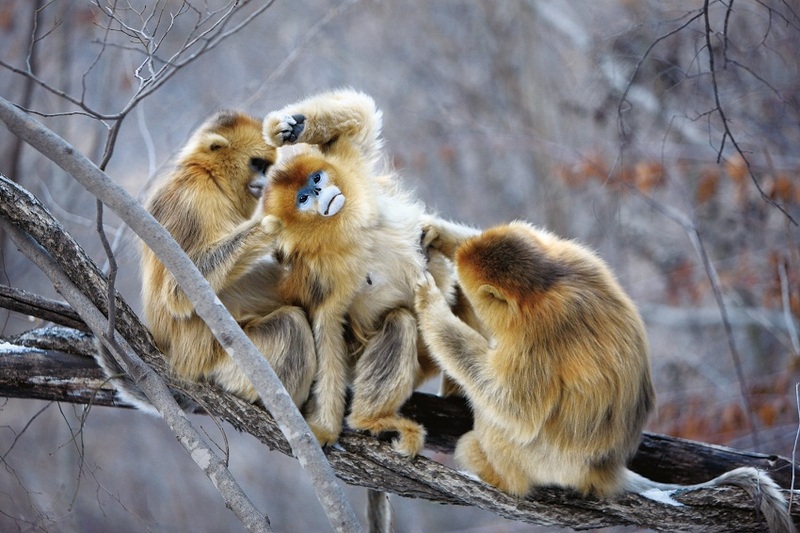 In general, these monkeys show mating behavior throughout the year. However, most infants are born during springtime or early summer (March to May). The female monkey’s communication usually initiates mating through various gestures and signals about her eagerness for copulation. Much like the humans, the female of the species gives birth to one young at a time. The gestation period is about six to seven months. However, quite like human twins, two baby monkeys might also take birth occasionally. The female monkey usually takes the responsibility to take care of the juveniles until they grow up. Other than that, the male monkey, along with the other members of the group, also play a responsible role in the protection of the baby. The age of sexual maturity is about seven years for the male monkeys, and around four to five for the females. Unlike most of their tropical counterparts, the dense fur that covers the entire body of these primates help them thrive comfortably in the subzero winters. The flat muzzle of these creatures is thought to have evolved to combat the temperature extremities. An interesting behavioral adaptation of these monkeys can easily be understood from their enormously large groups. This is to ward off predators like the clouded leopard. 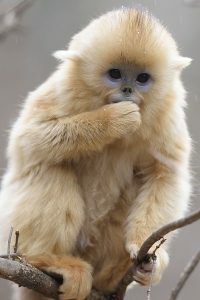 The most common enemies of the Golden Snub-nosed Monkeys are mammals like dhole, wolf, Asiatic golden cat, and leopard, as well as large birds of prey including golden eagle and northern goshawk. At present, the estimated heads of this species, that are left in the wild, range between 8,000 and 15,000 individuals. 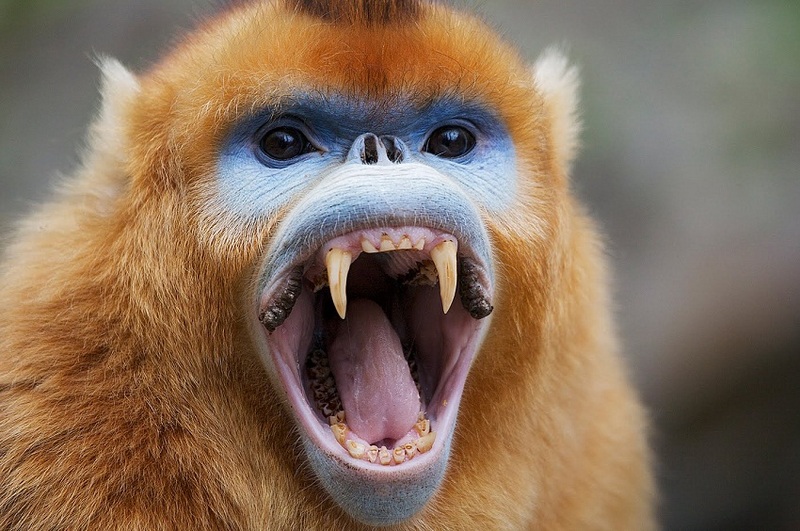 The IUCN 3.1 has classified these monkeys as Endangered (‘EN’) on its Red List. 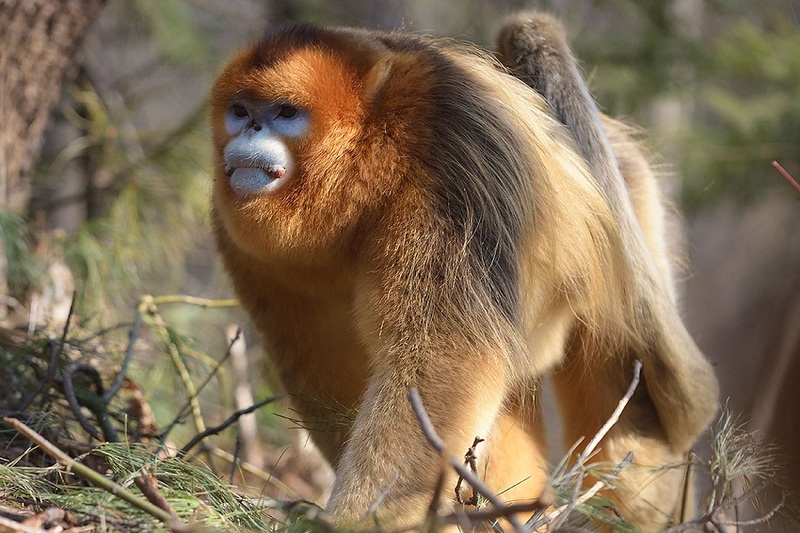 The Latin name of the Golden Snub-nosed Monkey roxellana is inspired by the snub-nosed courtesan of a sultan of the Ottoman Empire, ‘Suleiman the Magnificent’, who ruled during the 1500s. Though not langurs, these primates are often referred to as ‘snub-nosed langurs’ in some local regions. The fur for these animals was once so expensive and valued highly that only the highest officials were allowed to wear it.